​This is a free flip book (eBook) that is part of a collection of books to help teach English to students around the world. Mrs. Chips, the author and publisher, founded an online school to try to reach students in the most remote areas of the world who wish to learn but have little or no access to schooling (currently including girls in Afghanistan, Syrian refugee children in an orphanage in Turkey, and children in mountain villages of Nepal). 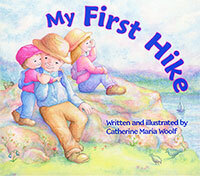 ​Catherine's first published children's book is about a little boy who goes hiking for the first time with his grandpa and sister. It's a board book for the very young and contains some of Catherine's earliest illustrations. 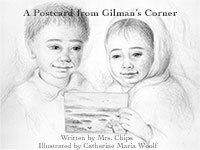 ​Catherine was one of a couple of illustrators for this book which is a collection of articles and poems for children published by the Christian Science Publishing Society. These are some examples of the 53 illustrations she did for the book.